When the Ugandan government announced that the anti-homosexuality bill was on hold, those pushing it immediately blamed international pressure on President Yoweri Museveni. Pastor Martin Ssempa said that the bill was "being deliberately killed largely by the undemocratic threats of western nations". He has a point. A campaign delivered half a million signatures to Museveni, various governments lobbied, the Germans said they'd cut aid, and now the US Congress has amended financial legislation (with bipartisan support) that would cut aid to countries deemed to be persecuting gay people. Introducing the legislation, congressman Barney Frank highlighted Uganda and noted that "the US has a fairly influential voice in the development area". Timothy Geithner, the US treasury secretary, has now said in a letter to Frank that his Treasury department "will continue to instruct the US executive directors at each of the MDBs [multilateral development banks] to seek to channel MDB resources away from those countries whose governments engage in a pattern of gross violations of human rights". Pressure is also mounting from Europe. The European parliament passed a resolution in December "reminding" Africa that "the EU is responsible for more than half of development aid and remains Africa's most important trading partner" and that "in all actions conducted under the terms of various partnerships" that sexual orientation is a protected category of non-discrimination. How financial pressure will play out remains to be seen. This month massive US funding for improving Malawi's power supply network went through despite that country criminalising lesbians. Someone blinked regarding Malawi but there is undoubtedly more pressure on governments who repress gay people than ever before. Germany didn't blink and did cut Malawi aid. Like Uganda, moves in the Democratic Republic of the Congo to criminalise gay people have also stalled – again diplomats have raised their concerns. But now there's a backlash. In Uganda, Ssempa presented a two-million-signature petition to parliament on 7 April demanding that the anti-gay bill be passed (and damn the consequences). In Cameroon there is a huge fuss over European Union funding for a lesbian, gay, bisexual, and transgender (LGBT) advocacy group. Cameroon's foreign minister, Henri Eyebe Ayissi, summoned the head of the EU delegation to protest against their support for people who "violate the laws of Cameroon". Like others in Africa, Cameroonian activists have received death threats, but this hasn't led those Africans I speak to wanting international pressure to stop – on the contrary. 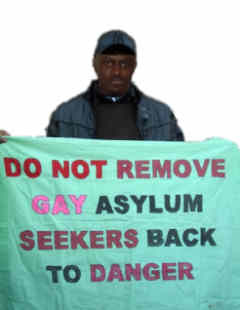 The criminalisation of homosexuality in countries such as Cameroon is also increasingly questioned by bodies such as the Global Fund to Fight Aids, Tuberculosis and Malaria. Funding for HIV/Aids prevention which involves LGBT people, and which governments are being required to tolerate, has led to LGBT community development in many countries (and not just in Africa). Hillary Clinton has said that the US is "elevating our human rights dialogues with other governments and conducting public diplomacy to protect the rights of [LGBT people]." Her state department has quietly funded and brought activists to the US so they can hone their skills, and moved to support LGBT refugees – supporting major developments at the Office of the UN High Commissioner for Refugees as well as funding inclusive programs. President Obama has backed this up. 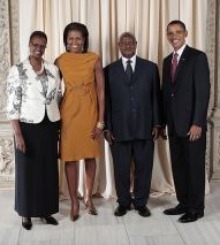 His comments against Uganda's anti-gay bill made headlines across Africa. Leaders such as Museveni are obviously mindful of both international and local concerns. So the Zimbabwean prime minister Morgan Tsvangirai spent last year telling local gay people one thing and the country's media another. Raila Odinga, his counterpart in Kenya, made a bizarre threat to "arrest all gays" at a rally in December. He then took it back. This, according to Kenyan activists, followed a meeting with European ambassadors, but they point out that the US ambassador in Nairobi didn't join in criticising Odinga. Explaining the disparities, Mark Bromley of the Council for Global Equality says the state department reports are "more of a kabuki dance than a liberation march" and many diplomats have not "done enough homework" but adds that: "If an embassy turns a cold shoulder to an LGBT human rights activist, or refuses to meet with that activist, then please let us know. We consider it part of our job to help facilitate those connections, and to scream to senior-level officials in Washington if an embassy is not open to such contacts." The US and others are often accused of hypocrisy on human rights but this year the US has submitted to the UN's universal periodic review process. Of the 228 recommendations received by the US during the review, three relate to LGBT rights and they were accepted. And increased international attention to LGBT rights is also showing up cracks in the anti forces. Last November, a group of Islamic and African countries struck out "sexual orientation" from a UN resolution on extrajudicial – non-state – killings. The US announced they would try to get the vote reversed and in December it was. By a landslide. Over a quarter of member states positively changed their votes – including a third of Africa – and many made clear it was domestic, not US, pressure which changed their minds. The Rwandan delegate, Olivier Nduhungirehe, reacting to claims that "sexual orientation" isn't defined, said: "Believe me, sir, that a human group doesn't need to be legally defined to be the victim of execution or massacre, since those who target their members have previously defined them. Rwanda has experienced this 16 years ago indeed, and for this reason our delegation will vote for the amendment, and calls on other delegations to do likewise." Support for LGBT rights internationally from western countries should be welcomed. Critics and headshakers (such as the New York Times editor, Bill Keller, who just warned of America's "missionary impulse") should remember that another source of international pressure (and funding) exists. Having lost at home, American evangelicals have transferred their culture war against gay people to countries such as Uganda. Their propaganda lines – LGBT people are a threat to children, homosexuality can be "unlearned", homosexuality is "un-African", any "concession" means "special rights" – can be heard repeated around the world by pastors such as Martin Ssempa and also, in Muslim areas, by imams.